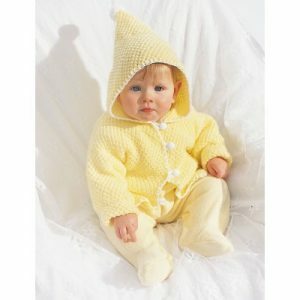 Hooded Baby Jacket Free Knitting Pattern by Bernat. Ever-so-darling knit hoodie finished off with a sassy pom-pom on the pointed hood and button closure. Sizes 6 – 18 months (chest measurement 16-20 in [40.5-51cm). Shown in Bernat Softee Baby knit using size 4 mm (U.S. 6) needles.